Caution: Reference herein to any specific commercial products, process, organization, or service by trade name, trademark, manufacturer, or otherwise, does not necessarily constitute or imply its endorsement, recommendation, or favoring by the Minnesota Pollution Control Agency. All workshop attendees receive information about installation cost-share programs and Blue Thumb resources to help get a project in the ground. Workshops are scheduled for 11 locations in the Twin Cities through June 6. For details and registration, visit the Metro Blooms workshop webpage or call 651-699-2426. The cost is $15 per household, though some locations have no fee because of local sponsorship. Operation & Maintenance of Stormwater Control Measures - A National Forum for O&M of Green and Gray Stormwater Infrastructure. August 4-7, Minneapolis, Minnesota. Environmental & Water Resources Institute (EWRI), American Society of Civil Engineers. Minnesota Stormwater Seminar Series: The Minnesota Stormwater Seminar Series brings exemplars of advanced stormwater innovation and knowledge to Minnesota to share what they’ve learned and how they’ve pushed the boundaries in the stormwater arena. The monthly seminar series is dedicated to stormwater and green infrastructure topics with an emphasis on successes and lessons learned from field implementation and applied research and evaluation, specifically for an audience of stormwater practitioners and professionals. Each event includes a presentation, panel discussion and Q&A with participants. Interested individuals can attend in-person at the St. Anthony Falls Lab, in-person at Minnesota Sea Grant at UMD, or participate online. Note: the Minnesota Pollution Control Agency does not endorse any organization, including those for training purposes. EPA Green Infrastructure Webcast Series: This series is geared toward public officials and practitioners just beginning to implement green infrastructure, as well as those looking to enhance established programs. For more information, go to the EPA's Green Infrastructure web site. Forester University Live and On-Demand Webinars: These webinars focus on a variety of water quality issues, including municipal separate storm sewer system (MS4) program implementation, construction site erosion control practices, and post-construction stormwater management. Visit the Live Webinar webpage to see upcoming webinars or the stormwater, erosion control, construction, or water efficiency On Demand Webinar webpages to see webinars that are available to be viewed today. Chesapeake Bay Stormwater Network: This series is on issues that impact the Chesapkeake Bay watershed, but the concepts may be applied to other areas. These webinars are generally free. For more information, visit the Upcoming Webinars webpage, or to see what's available on demand, visit the Archived Webinars webpage. Sustainable Cities Network: Many free webinars on a wide range of sustainability topics. Industrial stormwater training workshop, March 14, 2019. IS2202 - Industrial Stormwater Regulations, SWPPPs, Sampling and Monitoring. The registration fee is $170 and the workshop will be from 8am to 4:30pm. Visit the U of M Erosion and Stormwater Management Certification Program’s website for more information or to register. Register online or view and fill out the paper registration form. Nov. 29-Dec. 1: Minnesota Association of Watershed Districts conference, Arrowwood, Alexandria. Posted 7/17/18: Announcing the 2018 Campus RainWorks Challenge! - The Campus RainWorks Challenge seeks to engage with undergraduate and graduate students to foster a dialogue about stormwater management and showcase the environmental, economic, and social benefits of green infrastructure practices. The Campus RainWorks Challenge is open to institutions of higher education across the United States and its territories. College students form interdisciplinary teams with the support and guidance of a faculty sponsor. Teams must meet all of the eligibility requirements in the 2018 Campus RainWorks Challenge Brief. University of Minnesota Erosion and Stormwater Management Certification Program: For more information on stormwater training for contractors, engineers, municipal, and industrial site staff see the Program website and the current class schedule. CENTRAL STATES WATER ENVIRONMENT ASSOCIATION, Minnesota Section, 2018 Conference on the Environment, November 7, 2018, Minneapolis Convention Center. 2018 Landscape Revival: Native Plant Expo & Market. June 2 and June 9. Native Plant Expo and Market offers gardeners one convenient location to shop for Minnesota native plants from 6 local native growers and learn how to use the plants from conservation organizations. The goal of Landscape Revival is to promote the use of native plants by educating about their benefits for wildlife habitat, pollinators, water quality and landscape diversity. World Environmental & Water Resources Congress 2018, Hyatt Regency, Minneapolis, MN, June 4-7. The Environmental & Water Resources Institute (EWRI) is one of nine technical institutes of the American Society of Civil Engineers, the largest civil engineers' association in the world. This annual conference features hundreds of presentations throughout 13 concurrent technical sessions per day covering 20 technical areas. 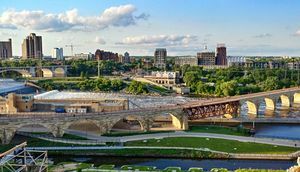 Its location in Minneapolis for 2018 provides a unique opportunity to learn about cutting edge issues and activities from a variety of water perspectives, with substantial sessions dedicated to urban water resources and stormwater issues. Daily and full conference registration options are still available. February 8, 2018. Road Salt Symposium at the Plymouth Creek Center in Plymouth, MN. For more information and to register, go to the Freshwater Society's web site. MS4 Workshop on Effective Inspections, October 25, 2017 at the Rogers Community Center in Rogers, MN. For more information, go to MECA's web site. Minnesota Water Resources Conference, October 17-18, 2017 at the Saint Paul RiverCentre. For more information go to the University of Minnesota's web site. Rebecca Higgins and Mike Trojan of the MPCA presented at the Minnesota Section-ASCE meeting on October 19. The topic was Stormwater Infiltration at Contaminated Sites. Stormwater Practice Maintenance Certification Workshop: May 8-9, 2017 at the Minnesota Landscape Arboretum. Sponsored by the University of Minnesota. 16th Annual Road Salt Symposium, Thursday, February 2, 2017 from 8:00 am to 3:00 pm at the Mounds View Event Center in Mounds View. For more information, and to register, go to the Freshwater Society's web site. MS4 Workshop on Effective Inspections, January 31, 2017 from 9:00-4:00 at the Verizon Wireless Center in Mankato, MN. For more information and to register, go to MECA's web site. Minnesota Water Resources Conference, October 18-19, 2016 at the Saint Paul RiverCentre. For more information, go to the Minnesota Water Resources Conference web site. Clean Water Summit, September 22, 2016 at the Minnesota Landscape Arboretum. The theme of the summit is: Green Infrastructure for Clean Water-Rethinking Redevelopment and Retrofits. More information can be found at the Minnesota Landscape Arboretum web site. Water Reuse Workshop, Monday, May 2, 2016 at CHS Field in St. Paul. Sponsored by the Freshwater Society, this is a "first of it's kind" event exploring the potential benefits for water reuse in Minnesota. For more information, to to the Freshwater Society's web site. MS4 Permit Workshop focused on inspection aspects of meeting your MS4 permit. Thursday, February 25, 2016' in Rochester, MN and on March 24, 2016 in Brainerd. For more information and to register, go to the Minnesota Erosion Control Association web site or contact the MECA office at 320-685-5444. Stormwater Meets Living Streets/GreenSteps Cities Workshop on Tuesday, March 8 at the League of Minnesota Cities in St. Paul. For more information and to register, go to the Minnesota GreenStep Cities web site. This event is free. 15th Annual Road Salt Symposium on February 4, 2016 from 8:45 a.m. to 3:00 p.m. at the Minnesota Landscape Arboretum in Chaska, MN. For more information and to register, go the Freshwater Society's web site. Applied Environmental Statistics Workshop, sponsored by the University of Minnesota Stormwater Education Program, February 1-5, 2016 in Farmington. For more information and to register, go to the University's web site. Minnesota Erosion Control Association (MECA) Annual erosion Control and Stormwater Management Conference and Trade Show. Double Tree Park Place, Minneapolis, MN. January 26th-28th, 2016. For more information, go the MECA web site. Minnesota Association of Watershed Districts annual conference and trade show. December 3-4, 2015 in Alexandria, MN. Go to the MN Association of Watershed District's web site for more information. Soil Science Society of America Conference Symposium--Soil and Vegetation Management for Stormwater Control (Session 44); Monday, November 16, 2015: 8:00 AM-11:50 AM; Minneapolis Convention Center, L100 IJ. Note this is part of the joint ASA-CSSA-SSSA International Conference. LEED Lunch and Learn: Sustainable Stormwater Infrastructure, Tuesday, November 17, 2015 from 11:30 am - 1:00 pm at Stantec in Roseville, MN. For more information, go the US Green Building Council, Minnesota Chapter web site. Stormwater Research Prioritization Meeting, Monday, January 5, 2015 from 1:00 -3:00 PM at the St. Paul Campus. The meeting will include a presentation on background and present state of stormwater research and a facilitated discussion to get input from stormwater professionals. For more information, contact Mary Dieltz at the University of Minnesota at erosion@umn.edu. "Can We Harvest Rainwater for Indoor Use?" Friday, October 17 from 8-9:30 a.m. at the McKnight Foundation and November 21 from 8-9:30 in St. Cloud at the St. Cloud City Council Chambers. Sponsored by the National Park Service for the Mississippi River Forum. For more information, contact Lark Weller at lark_weller@nps.gov. Minnesota Association of Watershed District Annual Meeting and Trade Show - December 4-6 at the Arrowwood Conference Center in Alexandria. Go to the MAWD web site for more information. Water Resources Conference. October 14-15 at the St. Paul RiverCentre. This conference presents innovative, practical, and applied water resource engineering solutions, management techniques and current research about Minnesota's water resources. At this year's Conference, there will be a special all-day session devoted to low impact development and stormwater. Streambanks and Stormwater: A workshop and tour of practices in communities. September 25 from 4:00-7:30 in Eden Prairie. For more information and to register, go to the University of Minnesota Extension's web site. Live from the Storm Drain: Monitoring Stormwater Pollution in Minneapolis. September 26 from 8:00-11:00 a.m. at Mississippi Watershed Management Organization. Sponsored by the National Park Service for the Mississippi River Forum. Contact Lark Weller at lark_weller@nps.gov to register or for more information. Clean Water Summit. September 11, 8 AM- 5 PM, Minnesota Landscape Arboretum, Chaska, MN. The 2014 Clean Water Summit will focus on both the costs and benefits of green infrastructure, including economic, social, and ecological factors. St. Croix Workshop on the Water: Engaging local leaders to preserve and enhance the St. Croix July 29, 5:00 pm - 9:00 pm Hudson, Wisconsin. Minnesota Green Roof Symposium. June 19, 2014 9 AM - 5 PM, Hamline University, St. Paul, MN. When Chester Creek Floods. June 12, 2014 2:00 PM- 7:30 PM, University of Minnesota Duluth. Minnesota Sea Grant is hosting an open house so that the public can learn about the economics of flood impacts and green infrastructure strategies to help reduce those impacts. This page was last modified on 17 April 2019, at 08:10.